Welcome back to Magazine Sixty, Steve. 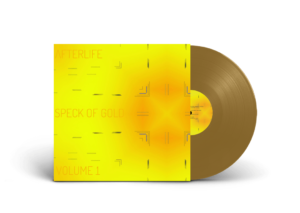 You are in the process of crowdfunding a vinyl release of your Afterlife album Speck Of Gold from 2003. So the first question is why have you decided to revisit that particular album in 2018? Earlier this year I created a post on social media asking fans what they would like to see me release to celebrate 25 years of Afterlife in 2019. A sort of “Best of Afterlife” if you like. They all asked for it to be on vinyl and specified their favourite tracks, a lot of which were from the original Speck of Gold double album on CD. Even 15 years since its release it is still one of my top selling albums digitally so it made sense to be the first album in a vinyl format since Simplicity 2000. This release is Vol.1 only as with vinyl the maximum playing time per side for top quality is only 21 minutes max. If it proves popular then vol.2 with the remixes will follow. I thought it would be a nice touch to have gold vinyl rather than black. It was great to dig the premasters out of the archives and have them mastered with full dynamic range for vinyl only. These masters sound better than the originals. And the second is talk us through the process of crowdfunding itself. Something which wasn’t an available option as such back in 2004? Diggers Factory provide an elegant solution to producing short limited runs of vinyl. You specify a number of discs to be produced. They recommend a campaign period of 50 days to receive the pre orders. Once that amount is met then production starts and the wax is delivered to Juno Records for delivery to each customer. In this case I specified 200 copies. If pre orders do not reach that figure then everyone who ordered it will be reimbursed automatically. What does Crowdfunding say to you about the breaking down of barriers between audience and artist and how each can now interact directly? I think the concept of crowdfunding screams AUSTERITY loud and clear. In this case it helps cash strapped non mainstream artists and labels to still release vinyl which has expensive set up costs that may result in a huge loss if they misjudge their market. That’s OK for big labels to absorb but small labels can go bust. There’s a lot of talk about the resurgence of vinyl sales on the increase but the amount is still pitiful in comparison to digital downloads and streaming which is a shame because the sound quality on vinyl is just so much better. I have bought rare vinyl on this basis and when it arrives I get a warm feeling that I was part of a bunch of people that actually made it happen and treasure that. Generally crowdfunding seems to be the new way for new ideas to become a reality via a populist vote unless you have a friendly bank manager or an investor that will want a share of the business. It’s a more transparent way of doing business and that can only be good. What does the album’s title: Speck Of Gold signify? Why did you choose Cathy Battistessa in particular to sing it? And can you tell us about how you married the music to the vocal? The track started as my reaction to the utter horror of the 911 attack. The world had become a very fearful place and I felt it was only the start of the madness to come. I began the original track the day after and it was incredibly dark hip hop. Cathy and I had discussed writing a track together so I called her and said “I have this really dark track that needs the sunshine of your voice”. When she sent the vocal back with those pure, melancholic lyrics I realised that the backing track needed to be more hopeful, less despairing, to create the right amount of juxtaposition, so I rewrote the track from scratch working with the vocals as inspiration. Still too dark. Three attempts and two years later it was finally complete after at least 100 hours of studio time. Naturally it had to be the title track for my next album. The original album featured a number of significant guests. Is there a certain track which you feel resonates more now than it did in 2004? Or did one of the collaborators capture something that has defied the time in-between? It has to be the title track Speck of Gold. Right now the world is in so much trouble due to human greed and stupidity it resonates more than ever with the opening line “Hope is all we have, with each birth, every tear, we have hope”. It’s time we put our differences aside once and for all and started living with compassion and intelligence. This world could be a beautiful place and we, at the moment, as custodians need to take responsibility for it. And finally. What else have you been working on, are there any forthcoming plans you would like to share moving into 2019? I am just working on the finishing touches of my next album called Everything Is Now which is scheduled for release on 7th June next year.